Electron Microscopy Sciences and Quantomix have joined forces here in The United States to market and sell the breakthrough solutions of Quantomix’s proprietary WETSEM™ Technology. 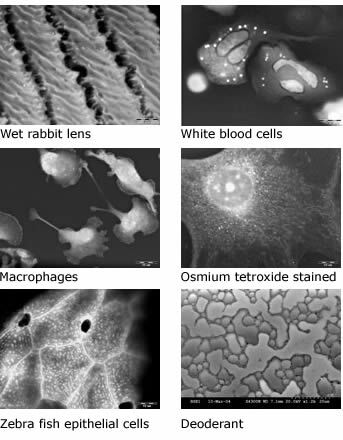 This technology enables scanning electron microscopes (SEM) to image and analyze wet samples such as cells, tissue biopsies, foods and ink, in their native environment. Eliminating the need for time-consuming preparation procedures, the WETSEM™ Technology ensures that sample integrity is not compromised by artifacts. QuantomiX innovative technology opens new opportunities for application specific tools to improve drug discovery, and advances treatment and diagnostic solutions for the medical and pharmaceutical markets. Electron Microscopy (EM) is a prime tool for high-resolution imaging, which has been the cornerstone of our understanding of living organisms and our material environment. Because EM requires samples to be placed in a vacuum, it does not lend itself for use with wet samples. In the 50 years since its development, this drawback has been a major impediment in the use of EM for biomedical research, and for many clinical and industrial applications. Light Microscopy, on the other hand, requires only minimal sample preparation. However, the resolution of light microscopy is limited to a few hundred nanometers. For the first time, rapid and routine EM imaging of biological samples in a wet environment is now possible without the artifacts normally associated with sample preparation. The New QX capsule completely isolates wet samples from the vacuum in the microscope chamber. This makes possible the imaging of fully hydrated samples- including food, cosmetics, ink, human, animal, plant, and microbial cells, tissues, and fluids-at resolutions unachievable with light microscopy. The QX capsule fits the standard SEM specimen stage. The capsule combines the function of a specimen holder, cell culture dish, or a tissue specimen holder with an electron transparent, vacuum tight window. This unique receptacle permits electron microscopy of samples held in water or any other liquid medium at atmospheric pressure. Imaging of samples in the QX capsule can be accomplished with backscattered electron detection, x-ray detection, or light detection, to reveal structure as well as material composition.